Why not a Three-Fer Endcap of Treat Shoppe Mix & Match theme, after all your pet surely deserves tasty snacks and treats in abundance. The Treat Shoppe masthead humanizes the offer, just like you anthropomorphize Fido and Fifi. 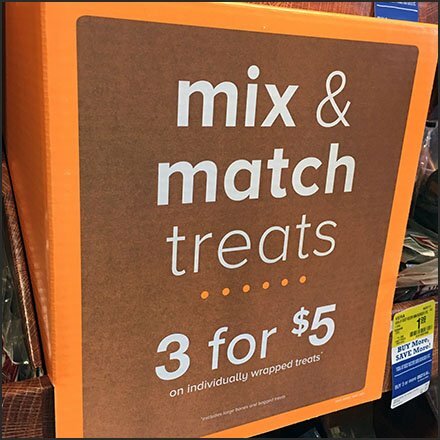 But the centered “Mix & Match Treats 3 for $5” bright orange “dimensional” is the true “hot button” for sales. Consider the entire Three-Fer Endcap of Treat Shoppe Mix & Match in the gallery of images, but pay careful attention to the three-dimensional, three-fer offer.